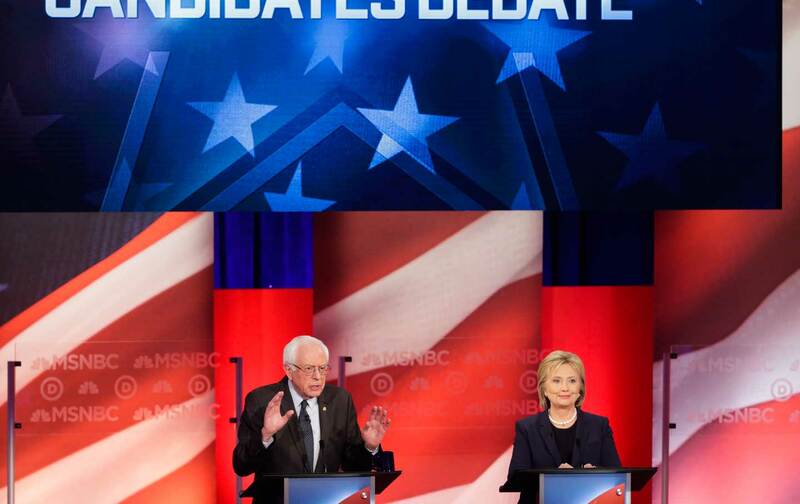 Earlier this month the social media teams for the two Democratic presidential candidates got into a heated—if not quite illuminating—spat on Twitter and Facebook about the meaning of progressivism. The Bernie Sanders campaign tweeted, “You can be a moderate. You can be a progressive. But you cannot be a moderate and a progressive”; while Hillary Clinton’s account replied that “an important part of being a progressive is making progress.” When asked about the exchange the following night, in an MSNBC debate, the candidates did not shed much more light on the question. “The root of that word ‘progressive’ is ‘progress,’” Clinton observed. When presidential candidates Bernie Sanders and Hillary Clinton spar over which one is more progressive, they don’t have the reality of the Progressive movement of 100 years ago firmly in mind. Each candidate has his or her own reasons for trying to claim the word. For Clinton, it is a way of trying to win over the young, left-leaning voters who overwhelmingly support her opponent, while Sanders uses it to associate himself with a resurgence of democratic populism. Today, the term mostly offers a way of talking about left politics without using the word “liberal” (with its unpopular top-down connotations, and its history of critique by the right) or—even worse—the word left. Nonetheless, there are some ways in which our own moment does closely resemble that of the early 20th century: in terms of rising income inequality, growing public anxiety about the political role of business, and a widening sense that business interests are cavalier with public safety and hostile to the public good. Although there are many points of commonality between Sanders’s campaign and the Progressive efforts of the last century—the criticisms of business, the advocacy for greater regulation—in one key way, his campaign seems very different. The intense political emotion, the sense of disillusionment with the present, and the idea of the necessity of broad-scale transformation are all at odds with the politics of early-20th-century Progressivism, which was deeply concerned with the threat of upheaval from below. In this sense, although not in others, the Clinton campaign may be more in keeping with Progressivism as it has been classically understood: While her proposed reforms are far less bold than those of the Progressives, she seeks, as they generally did, to channel political unrest, while leaving underlying social inequalities untouched. In order to understand where Sanders and Clinton fit within the Progressive tradition, it’s vital to know who the Progressives were and what they represented. Such questions have bedeviled generations of historians because there are no easy answers. Workers and farmers formed the largest constituencies of Progressive Era reform. But urban middle-class activists, white and black, male and female, also made their mark on the Progressive tradition. Progressives shared a belief in social improvement by way of public or collective action, focused on a wide array of social ills, and offered a variety of remedies and reforms: from a graduated income tax to public kindergartens, from eight-hour day laws to municipal ownership of utilities. A consideration of the Progressive presidents of the early 20th century, Teddy Roosevelt and Woodrow Wilson, shows why drawing boundaries around a Progressive tradition can be a hazardous undertaking. Roosevelt attacked the outsized role of corporate power, and called for a national system of health insurance and for pensions for retirees. Yet Roosevelt also had good friends on Wall Street, betrayed African Americans’ civil rights, and was an ardent imperialist and warmonger. Wilson presided over such watershed reforms as the income tax, the Federal Reserve Act, the direct election of senators, and the extension of suffrage to women. Yet Wilson was also a white supremacist who oversaw the segregation of government offices in Washington, and whose “war to make the world safe for democracy” did not accomplish its stated goal, to say the least. Both Sanders and Clinton have their Progressive Era heroes. Sanders has a plaque of the Socialist labor leader Eugene V. Debs mounted on the wall of his office. Like Debs, Sanders embraces the secular faith in human solidarity, and calls for sweeping reforms to create a more equitable and humane society. But that doesn’t make Sanders a 21st-century version of Debs, who worked to create a “cooperative commonwealth” resting on the power of the unions, alliances, and cooperatives of workers and farmers. Though Sanders speaks of a “political revolution,” how far that extends beyond a more or less traditional presidential campaign is often difficult to discern. Clinton, meanwhile, has cited the work of Jane Addams on behalf of immigrant children as the type of service that has inspired her. Addams was a Progressive reformer who sought the middle ground between capital and labor, between Debs and the railroad corporations. A political career, of course, was closed to Addams, who spent her life devoted to often small and partial steps to improve the lot of the urban poor. Clinton is a powerful politician who seeks the middle ground between Wall Street and its critics, and who sees compromise and halfway steps as the preferred road to progress. Drawing boundaries around a Progressive tradition can be a hazardous undertaking. The future of progressivism will unfold at the same time as the political system undergoes a realignment. In recent decades, the Republican Party has steadily evolved into a conservative party, purging its progressives and moderates and cornering the political market on white racial resentment and xenophobia. Meanwhile, the Democratic Party is shedding its ancient reliance on the white-supremacist vote, and today embraces multiple progressivisms that have pushed the party’s positions on domestic policy to the left since a Clinton last occupied the oval office. A similar shift has yet to occur on foreign policy, as progressives within the Democratic Party, from Obama to Clinton to Sanders, continue to embrace the prerogatives of the US war machine. But perhaps a new wave of progressive renewal will bring to the fore more humane and universal notions of equality and social justice. The future of progressivism is inextricably linked with the future of the American South. The current Democratic primary campaign is only one example of this. But even more important is the likelihood that come November, Georgia, South Carolina, Alabama, and other Southern states will revert to what they have been for most Democratic Party presidential candidates in recent decades: states to be ignored. In most states of the Deep South, the Democratic Party is a mere shell, barely competitive in national elections. Such a political vacuum disserves and disenfranchises millions of citizens—overwhelmingly African Americans—who need a government that works for them. To allow this neglect to continue would be an egregious mistake. The birth of a sustainable movement in the South has been a dream of the progressive-minded for generations. After the Civil War, Reconstruction offered a chance for the South to remake itself into a more egalitarian region, before political violence by Southern whites and exhaustion among Northern whites brought it to a premature end. Subsequent attempts to challenge the conservative (often Democratic) status quo regularly collapsed: The Western-dominated Populists of the 1890s failed to rally Southerners of any race to their cause over the long term; widespread textile strikes in 1934 fell victim to a lack of local institutional support; the CIO’s postwar “Operation Dixie,” which attempted to unionize thousands of Southern workers, couldn’t overcome racial hostility; and, finally, attempts by African Americans in the late 1960s to remake the Southern political landscape, through the Mississippi Freedom Democratic Party or Alabama’s Lowndes County Freedom Organization (the original Black Panther Party), fell short. More recent campaigns like Jesse Jackson’s 1984 and 1988 presidential runs further demonstrated the perils and the possibilities of progressive politics in the South. Although Jackson’s presidential campaign had the support of large amounts of African-American voters in 1984, and forged an even more diverse coalition (including poor whites) in 1988, he was still unable to win the nomination—or even to win significant concessions from the Democratic leadership. During his 1992 presidential run, Bill Clinton used a speech by the rapper Sister Souljah before the Rainbow Coalition to distance himself from Jackson, thereby solidifying support among moderate white voters. Meanwhile, liberal and left-wing elements within the Democratic Party struggled to resist the leadership’s sharp turn to the right, a pivot spurred by consideration of the limits of electability in post-Reagan America. Neither Democratic candidate is untouched by this complicated history. Bernie Sanders endorsed Jackson for president in 1988, and his focus on class issues is an echo of many of the concerns Southern progressives have had for decades, not least the 1966 “Freedom Budget” proposed by civil-rights leaders A. Phillip Randolph, Bayard Rustin, and Martin Luther King Jr. Hillary Clinton, who promises to address the concerns of Black Lives Matter activists and to resume the fight for comprehensive immigration reform, observed Southern politics firsthand while she was first lady of Arkansas. If Clinton is sincere about these initiatives—and considering how much she will likely owe African Americans if she wins on Super Tuesday, she will not have much choice—there will be further opportunities for Southern progressives to push for even more significant change. It is time for progressives to assume a more active role in the Southern wing of the Democratic Party. Movements such as the Fight for $15, which has made a strong showing in Atlanta, and the Moral Mondays protest movement in North Carolina show the desire for a resurgence of progressivism in the region. Demographics alone will not be destiny, but the forging of coalitions between African-Americans and a growing Hispanic population, along with working-class and middle-class whites, offer a promising beginning. If the Sanders campaign for a “political revolution” leaves a lasting legacy in the South, progressivism will be revitalized in the region as never before. But this has to happen regardless of who wins next week, or in November. The Democrats can win national elections without the South. But they will not have the political will, or the muscle, to effect truly progressive change without Southerners. At the risk of being disagreeable, let me start by disagreeing with the premise of this forum: Trying to figure out where Bernie Sanders and Hillary Clinton fit into the history of “progressivism” only muddles the key differences between them. It can hardly be otherwise, since the term has had such a promiscuous life in American politics. A century ago, racist Southern Democrats and the founders of the NAACP both embraced it. A few decades later, so did the Communist Party. Sometime in the 1990s, it became a fallback identifier for pretty much anyone The Nation and its journalistic kin smiled upon. Fortunately, excellent substitutes are available. Hillary Clinton is best described as a liberal. Like liberals from Woodrow Wilson to Franklin Roosevelt to Lyndon Johnson, Clinton wants to use the federal government to improve the lives of the majority of Americans. Like nearly every Democratic presidential candidate since the 1970s, she makes special pitches to women, non-whites of both genders, and the LGBT community. But she largely views social movements as creatures to be wooed and managed. What she really cares about is shrewd, effective governance. Like every liberal president (and most failed Democratic nominees) since Wilson, she wants the United States to be the dominant power in the world, so she doesn’t question the massive sums spent on the military and on the other branches of the national-security state. Bernie Sanders, on the other hand, is a leftist. Although he has been winning elections since 1981, Sanders resembles his hero, Eugene V. Debs—the Socialist who ran five quixotic races for president, the last time, in 1920, from a prison cell—far more than he does a standard-issue career politician. Other pols identify with “revolution” and claim their campaign is a “movement.” But Bernie really means it. He is perpetually on the attack against undue power and misused privilege, armed with an unvarnished class-conscious message that, until the emergence of Occupy Wall Street, had long been absent from the public square. He advocates policies he knows even a Congress controlled by Democrats would be quite unlikely to implement: breaking up the biggest banks, making public colleges and universities free to all, outlawing private donations to campaigns, and more. Except for increasing aid to veterans, he seems cold toward every part of the military establishment. His true foreign policy is, in effect, a domestic policy that would turn the United States into another Norway. Despite these fundamental differences between Clinton and Sanders, the fierceness of their rivalry should not obscure a central truth of political history: Leftists and liberals have always needed each other to push America toward becoming a more humane, more equal place. Radical activists and intellectuals promote fresh ideas, challenge entrenched elites, dedicate themselves to grassroots organizing, and push liberals down paths they might otherwise have avoided or tiptoed along at a craven pace. Liberals build governing coalitions that enact measures, from the progressive income tax to the Civil Rights Act to Obamacare, which improve the lives of ordinary Americans. It would be a serious mistake for “progressives” of any stripe to ignore this symbiotic relationship. Leftists backing Bernie ought to realize that the route to a social-democratic Promised Land will be long, arduous, and uncertain. Clintonian liberals should embrace the passion for a transformed America that has always been essential to making meaningful reforms in the existing one. Neither can ignore the certain consequence of an internal battle that lasts beyond the time when one of the two candidates secures enough delegates to win the nomination: a federal government under the total control of a Republican right that is determined to undo nearly everything liberals and leftists have achieved. Charles PostelCharles Postel, an associate professor of history at San Francisco State University, is the author of The Populist Vision (Oxford University Press, 2008).